Tucked away in the Genesee Regional Market complex in Henrietta, NY, is one of our favorite local haunts. 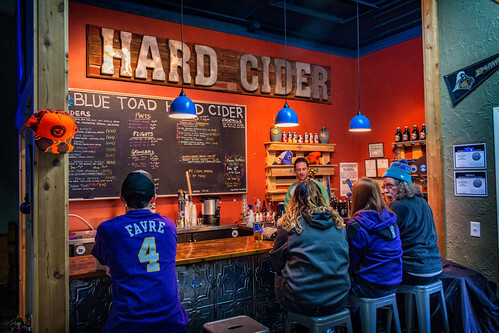 It is hard to pass up the opportunity to visit Blue Toad Hard Cider where we can spend some time playing card games over a couple pints of locally sourced hard cider. After a few years of watching Blue Toad grow, we felt it was time to include their story for the blog. 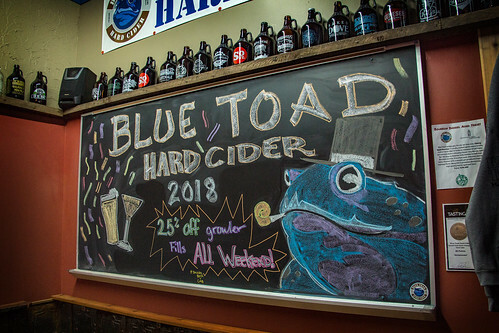 Stopping in one Sunday afternoon, we spent some quality time with bartender extraordinaire, Adam Washbon, trying out the different ciders and getting the inside scoop on all the work being done at Blue Toad. 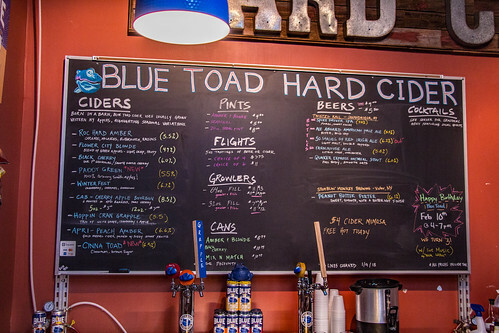 Blue Toad Hard Cider’s exterior is fairly nondescript and situated in the back corner of the Genesee Valley Regional Market next to a Yoga studio. Walk through the doors though, and you come upon a small, cozily-lit tasting room. 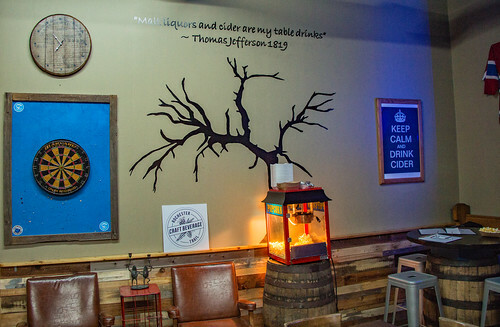 There is a small bar, with seating for approximately six people, however tables are scattered throughout the tasting room with some unique re-purposed church pews to sit at as well. 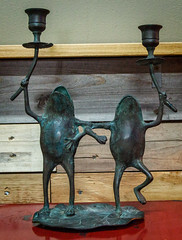 Toad themed décor surrounds you on all sides. A dart board and some table games are available to play if you find yourself wanting to do so. Having stopped in at Blue Toad often, it was nice going through the selection of ciders as if trying them for the first time. 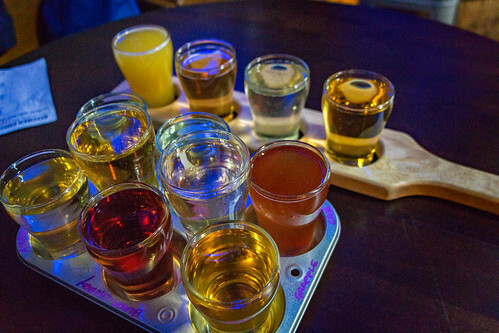 A flight of 4 5-ounce pours costs $7.75; tack on an additional two for $11.00. Adam is able to easily answer any questions you may have about the various ciders available and is quick to offer suggestions based upon the palate and preferences of the many varied customers. Below is a look at the diverse ciders available to try on the day of our visit. Clean and crisp, with a nice full body, not cloyingly sweet. Notes of caramel, molasses, and raisins. Brighter acidity with more perceived dryness. It has a well-balanced tartness; great for people looking for a drier cider. A bit of a spicy grape aroma. Smooth, and slightly sweet, but not cloying; cranberry imparts a nice tart bite and pulls the sweetness back a few degrees. Easy drinking and a bit sweeter, but cherry adds an interesting drink-ability. Notes of cranberry, caramel, and cinnamon. This has a reserved sweetness level with the berry flavors coming through nicely. Very sweet, with thick cinnamon notes. A bit of a spice bomb. One of my favorites; gorgeous floral nose from the hops with a lively effervescence. Unique lemon and tropical notes that get better each time I have it! Very fruity, almost like a sweet white wine. Apricot sticks around for a bit after each sip. A cider for those with a sweeter palate. Tried this from a can, where it had much more astringency then what I recall fresh on draft. Sometimes they might serve this with a wedge of lemon. Black Cherry Cider aged for six months in Bourbon barrels from Honeoye Falls Distillery. Amazing bourbon and vanilla nose. Notes of cedar and tobacco; spicy and semi-tart. I could see this being aged for a while; quite complex and truly unique. I like Blue Toad because they offer up a cider to fit any mood you might be in. A decent selection of dry and sweet ciders, as well as additional fruit blends, are sure to please everyone. I am really impressed by their hopped cider as I find the use of hops in cider to be especially interesting and unique. The Bourbon barrel aged cider was also quite well made and I hope to see more experiments like this in the future. It can also be fun to re-examine a cider you might not have tried in a while, as recipes and apple ratios tend to change a bit year to year. 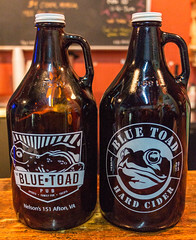 Blue Toad Hard Cider was established in 2015. Greg Booth, Scott Hallock, and Todd Rath are three friends who grew up in Scottsville, NY. Back in 2013 they talked about opening a brewery but realized that so many other people had already done so and they were worried about saturating the market. Todd, who goes by the nickname “Toad”, moved to Virginia and opened up a bar in the Blue Ridge Mountains called the Blue Toad Pub. The name Blue Toad seemed appropriate and if you look at the back of the toad on the original logo, you will see what resembles the Blue Ridge Mountains. Greg, Scott, and Todd realized they could diversify in our region and took the name Blue Toad to establish a NY Farm licensed Cidery. All the initial glassware and growlers were available from Todd’s business in Virginia so it made getting up and running a bit easier. Soon Greg was busy making ciders using locally sourced apples at their location in Henrietta. Eventually, the Virginia location would also start crafting ciders from their locally sourced apples as well. Not only is Greg the head Cider maker, but he is also a full time teacher and father of two. Luckily, he has assistant cider makers to assist with day-to-day operations. Scott runs the front of the house when not working at his primary job with the Monroe Department of Health. 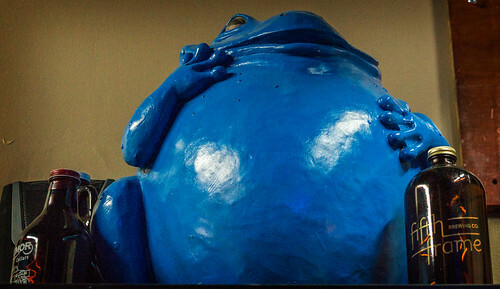 He has become Blue Toad NY’s “Mr. Fix-It” and solves any technical problems that come up with the brewing system. Greg and Scott have been able to maintain full-time jobs while also running Blue Toad, not an easy task, but they succeed in making it work. Greg learned much of his cider making techniques from the folks over at Bellwether Hard Cider, on the western side of Cayuga Lake. Bellwether is one of my favorite local cider producers known for producing artisanal ciders using both English and French cider apples. Greg tends to use New York edible apples in his recipes, as opposed to the less common heirloom varieties. His goal is to produce approachable, sessionable, gateway type ciders, with a few experiments thrown in for good measure. He force filters the cider four times to be able to quickly get the finished product out to the customers. Greg sources apples from local orchards such as Schutt’s Apple Mill in Webster and Red Jacket Orchards in Geneva. Often when we visit Blue Toad, Adam is behind the bar. His primary job is at a local recreation center, but back in 2015 he realized that it would be fun to bar-tend at one of the nearby craft breweries as well. He knew Greg and his family from the rec center, and was offered the job at Blue Toad. For Adam, it is also about the customer’s experience, not just what you are serving them. He wants to help people have a fun and enjoyable time while hanging out at the tasting room. The job is much more social then he originally thought it would be, and he has a great time interacting with the customers. Adam has helped establish a loyal fan-base of customers who enjoy the camaraderie and relaxed atmosphere. 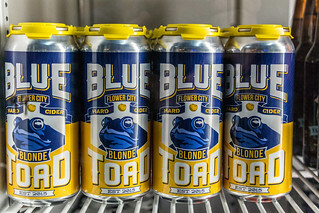 Blue Toad has a NY farm license; it also has other beverages on tap such as local craft beer from breweries like Twisted Rail and Stumblin’ Monkey. Hard Cider cocktails are concocted with spirits from nearby Black Button Distillery. The Honey Crisp cocktail is an especially tasty drink made from Black Button Distilling Bourbon, honey syrup, rhubarb bitters, and Roc Hard Amber cider. Customers also enjoy blending different ciders together to make interesting new flavor profiles with clever names like Dirty Blonde and Cherry Bomb. There is a complimentary popcorn machine if you crave a salty treat while enjoying your cider. Potato chips are also available for purchase, and patrons bring in their own food to enjoy as Blue Toad does not have its own kitchen. Blue Toad uses a mobile canning line and their cider is available from Niagara Falls to the eastern edge of Cayuga County. Their lineup is found at most area Wegmans, with the most popular varieties being the Blonde and Amber. Luckily, many of the seasonal flavors are canned as well. Blue Toad has run a mug club for the past few years and this year they plan on including locally handcrafted mugs. Details of the program are still being worked out so check at the bar if you are interested. Hats, T-Shirts, Sweatshirts, and pint glasses are all also available for purchase. If you have a dog, feel free to bring it along as the tasting room is pet friendly. So what does the future hold for Blue Toad? Hopefully they are able to eventually expand and be able to open a larger tasting room with more food options. 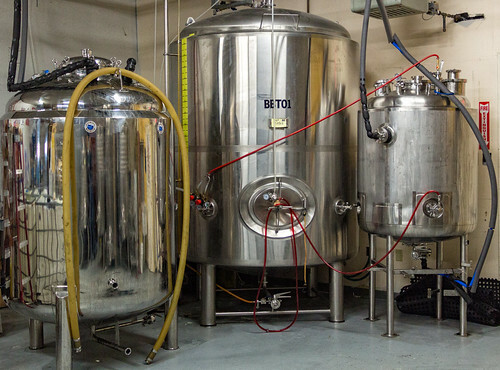 A larger space would also afford them the room to have their own canning line as well as increased production ability. This spring they will be canning the Flower City Lilac, a unique cider that is actually made by steeping dry lilac flowers in the cider. Greg has also just a released a new barrel aged cider using Bourbon barrels from Honeoye Falls Distilling. We love stopping at Blue Toad as the intimate atmosphere is very conducive to relaxing and playing card games. It is always a pleasure seeing new people discovering their ciders for the first time, and then seeing these same folks return for repeated business. I can only hope that Blue Toad can expand and grow the business without losing the atmosphere that makes them so unique. Be sure to stop in and try a flight or a pint of cider. And if Adam is there, you can be sure to enjoy some Dave Matthews Band and stimulating conversation! Henrietta, NY originally consisted mostly of farmlands with an agricultural economy. Development really didn’t take off until 1954 with the addition of the NYS Thruway and the Genesee Valley Regional Market. The Market was originally a food distribution center for nine counties in Central and Western NY. While some retail shops and restaurants still exist, the market has moved more towards commercial production and distribution operations. This entry was posted in Cider Maker and tagged Cider Maker, New York by tanders1. Bookmark the permalink.